Maybe you've spent some time on Reddit or Tumblr and noticed a few different variations of an internet meme called "Overly Attached Girlfriend," featuring a wide-eyed smiling girl whose facial expression is enough to make you question her level of sanity. Although she went viral back in 2012, her memes can still be found all around the web, and she's pretty hard to miss! 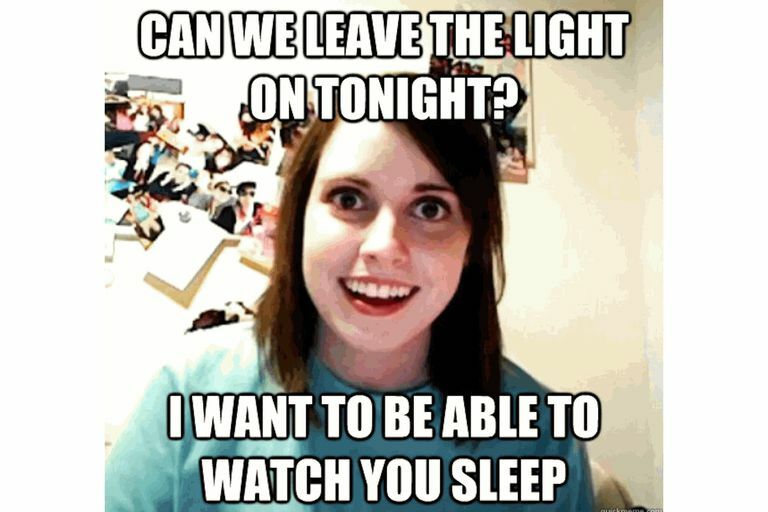 The Overly Attached Girlfriend memes are hilarious and totally relatable to almost anyone who's been in a relationship. Here's a brief summary of what we know about it. On June 6th, 2012, YouTube user wzr0713 (also known as Laina Walker) uploaded a video on her channel in response to a competition Justin Bieber started, where fans could submit their own versions of his "Boyfriend" song instead entitled "Girlfriend" from a female perspective. The video starts off with Laina taking a few seconds to smile and stare into the camera before breaking out into song with Justin Bieber's Boyfriend music playing in the background. The lyrics she sings in her version of the song all reflect the habits of an overly obsessive girlfriend. According to Know Your Meme, the video had received over 1.35 million views within less than 48 hours. Almost five years later, the YouTube video has 18.8 million views. Nearly all image macro memes begin on either 4chan or Reddit (or sometimes Tumblr), before making their way to other social networks like Facebok, Twitter, Tumblr, and Pinterest. The day after Laina had uploaded the video, one particular Redditor submitted the video link to Reddit, dubbing it "Overly Attached Girlfriend." The link attracted hundreds of comments and a dedicated Quickmeme page had been set up for it. Viral spread took off, and the meme started showing up in places like BuzzFeed, all over Tumblr and several other news sites that cover Internet culture. The spread of this meme has been insane. An official Blogger website has been set up by a fan and can be found at OverlyAttachedGirlfriend.com (The site has since vanished). Recent meme images, videos from her YouTube channel and other photos or news are posted there. An Overly Attached Girlfriend Tumblr blog was created (and has since been retired), but you can widen the search by searching the tag “Overly Attached Girlfriend” on Tumblr as well. It wasn't long before the search for Overly Attached Girlfriend's male equivalent began. About a month after the original meme went viral, a Reddit user posted a photo of himself explaining that his friends kept telling him that he looked "like a certain someone." Soon afterward, the post reached the front page of Reddit and became a meme itself. Feel like you’ve got a good caption to pair up with Laina’s wide-eyed image that really captures the essence of a deranged and overly possessive girlfriend? The easiest thing to do would be to head over to her Quickmeme page to make your own. That will take you to the Captionater, where you can set the style for your font and input the captions on the top and bottom of the image. Easy as pie! If you want you can save your new meme to be viewable on the Quickmeme website, make it private or leave your name as anonymous. Once you’re done, you can share it on all your favorite social networks right from the Quickmeme site. To Doge or Not to Doge? Such Crazy.